Baby Sister Homestead: It's the Most Wonderful *Stock* Time of the Year! After the fat has been skimmed, it's got a beautiful color and opacity. 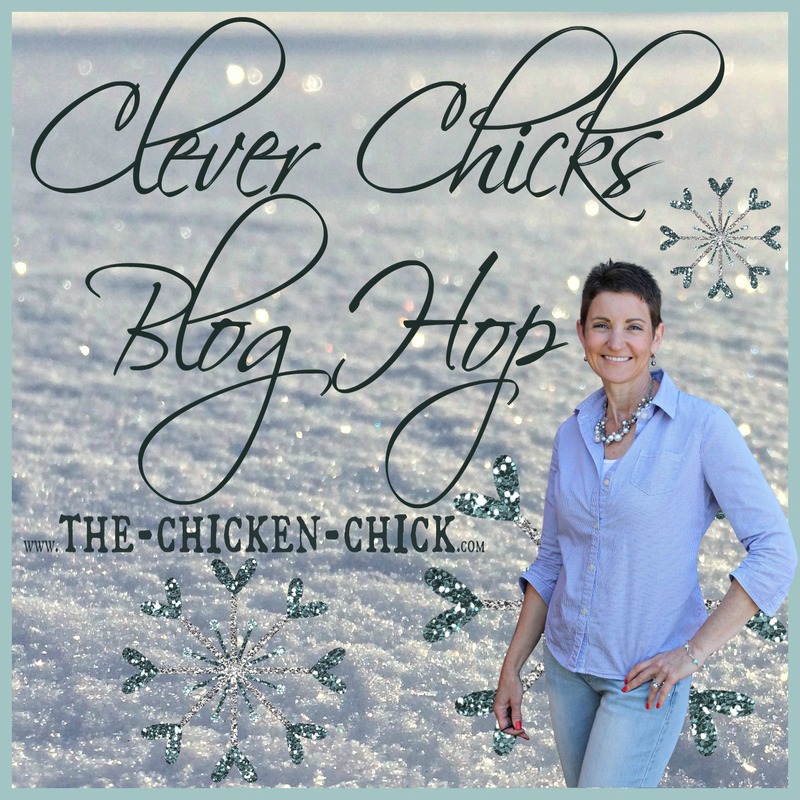 Wintertime in places where temperatures drop below freezing – there’s both ups and downs. One of the major high points is the ability to run the woodstove. Where I used to live in Louisiana, we got to use the fireplace maybe three times a year. In northwest Oklahoma, it’s a bit of a different situation. The woodstove gets to run quite often, which offers unique opportunities, of which, making stock is my favorite. Stock can be added to almost any recipes in place of water – soups, stews, gumbo (my favorite). You can use it to deglaze a pan when you’re cooking down meat or browning onions. Aside from the taste, there’s lots of other benefits, as well. 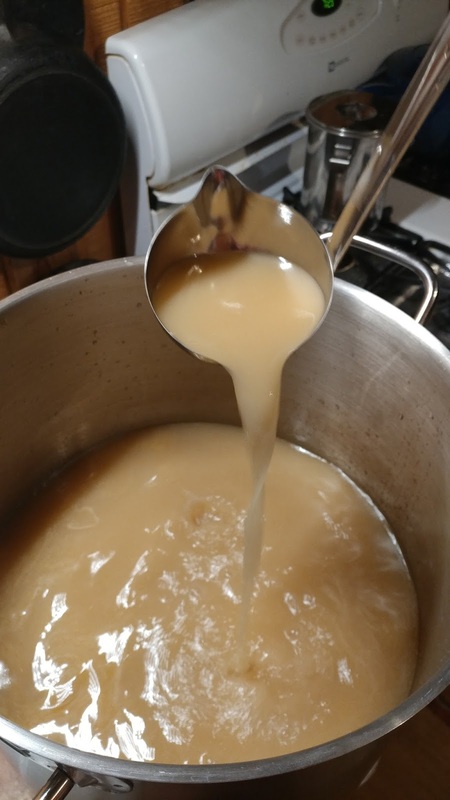 According to Sally Fallon Morell in Nourishing Broth , it “can help prevent and control arthritis, bone loss, digestive disorders, skin problems, and even cancer and mental illness.” It also tastes good. I keep a “stock bag” in the freezer all of the time. Any time I peel carrots, onions, garlic – the peels go in the bag. If I chop up tomatoes – the annoying little spot where the stem attaches goes in the bag. When there’s chicken for supper – the bones have an after-dinner engagement with kitchen shears, and in the bag they go. 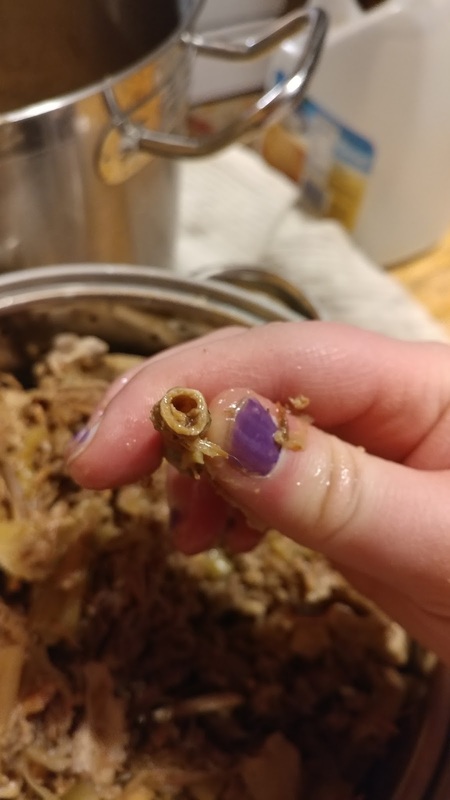 (It’s not just chicken bones, any bones get put in there, we just happened to have chicken the other night and that’s what the most recent stock is primarily made from.) 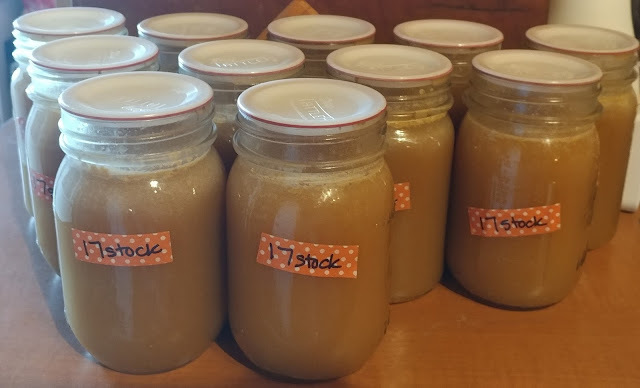 Once I run out of room in the freezer or the bag gets overfull, then I make stock. Stock can be made from a wide variety of items. The official canning recipes you’ll see are something like this one from the Ball Fresh Preserving site. Naturally, I don’t make my stock like that, but I do follow the general idea. Most recipes call for some type of meat, followed by onions, carrots, celery, garlic, maybe some herbs. Those are a good safe place to start. If you’re a bit more adventurous, as I myself am, here’s some stuff to add, and some to avoid. Alliums – Onions, garlic, leeks, shallots, green onions. You name it, they are great in stock. I toss skins from all of these into my stock bag (the end with the roots included, as long as it’s not totally full of dirt). Carrots – Skins, the end where the greens were, the dried out funny-looking ones you forgot in the fridge for a few weeks. As long as it’s not stinky and slimy, toss them in. Celery – Use the leaves, the root end and everything in between. Normally my dad eats the in between part, but sometimes it ends up in the stock pot, too. Tomatoes – Probably my favorite thing to grow in the garden. All summer/fall while the tomatoes are going strong and coming into the house in droves, they get used 100%. I chop off the stem end (cherry/plum types) and cut the cores out (paste/slicing types) and toss all that into stock bags. My tomato-season stocks tend to be a little heavier on fresh-frozen tomato than my off-season stocks. At that point, I just add in some dried tomatoes or tomato powder to the pot. Brassicas – Broccoli, Brussel sprouts, cabbage, cauliflower, collard greens, kale, kohlrabi, mustard greens, pak choi, turnips. These guys all add an overpoweringly strong flavor to your stock. Put them on the side to feed to your pets – rabbits, pigs, chickens, small children - all benefit from eating this stuff. Or compost it. Just don’t put it in the stock bag. Slimy/Stinky Things – Yes, you can use old-about-to-go-bad veggies. Just remember, you’re going to be eating this stock. If it doesn’t look like something you’d consider eating, don’t put it in the stock bag. If you’ve got stuff that will go bad soon, and you know you’re not going to eat it, don’t let it go bad – put it in the stock bag or feed it to the animals, just don’t waste it. The "Use Sparingly or Else It May Get Ugly"
Potatoes, Corn Cobs, Cucumbers, Lettuce – They don’t add a whole lot of flavor or healthy juju (getting some real fancy words in, ain’t I?) You can put them in, but I prefer to turn them into bacon and eggs – send them to the barn, and those guys will eat ‘em up. Peppers – I do sometimes add bell pepper scraps to my stock, but not so much hot peppers. That’s about the only thing our pigs don’t like. Just don’t add a ton, and it’ll add a nice subtle flavor. and bird bones hollow out like this. When I’m actually ready to make the stock, I dump everything into my cooking vessel. Add cool water and vinegar (see section below on vinegar), and let it sit for about 1 hour. Bring it to a simmer, and let it cook. The bare minimum for flavor that I’ve found is 4-6 hours of cooking. That will give you stock like you’d get at the store. If you want the real, super-gelatin, healing awesomeness that you see in books like Nourishing Broth , let it cook. I let it go until I can break the bones easily by hand, and the stock looks opaque. Typically, I let it go on the woodstove, in the crock pot or electric roaster for 36-48 hours. (If it’s on the woodstove, I usually leave it longer, and we just get stock out of it as we cook.) Once the bones are beginning to fall apart, I take the pot off the stove, let it cool, and start straining everything. I use a normal strainer first (with the big holes) then pour the liquid through a jelly bag to remove any remaining sediment. Then into the fridge (or on the porch, if it’s cold enough) to let the fat separate. Remove the fat - if you don’t get the fat off before you process the jars, it may get between the jar and the seal, causing your seal to fail. At this point, you can put it into ice trays and freeze stock cubes or you can pressure can it. I’m guessing you could probably put it in a few shallow pans in the dehydrator and come out with something like Better than Bouillon. As I haven’t tried it, though, who knows. It’s an eventual project, and I’ll let you know how that works out. Crack the bones with a meat cleaver or kitchen shears. (If you can’t crack them, it’s okay, you just won’t get as much marrow from the bones unless you cook them a long, long time. )Add the bones, veggies and herbs to your stock pot, roaster or crock pot.Cover with cool water and vinegar. (See notes on vinegar, should be roughly 2T – ½ C per gallon of water, depending on bones. )Let stand for about an hour.Bring to a light simmer, and let it cook at least 4-6 hours. Add more water as needed.Strain out bones, veggies and herbs in a large colander.Pour stock again through a cheesecloth, jelly bag or coffee filter to remove remaining solids.Put the stock in the fridge, and let the fat come to the top.Remove the fat once it’s congealed.Bring the stock to a boil. If the stock is not gelled to your satisfaction, now’s the time to boil it down some more to condense it. Fill hot pint or quart jars with 1” headspace. Wipe rims with a towel soaked with vinegar and water (this helps remove grease while still being food-safe). Add lids.0-1,000 feet – process pints 20 minutes, quarts 25 minutes at 10lbs pressure. Over 1,000 feet – process pints 20 minutes, quarts 25 minutes at 15lbs pressure. Washi tape works great for marking jars. Last fall we started with color-coding years with washi tape labels. If all goes well, 2017 will be polka-dots. What do you do with the fat? Could you cook with it? Yes! If I'm doing plain old chicken stock by the recipe for egg drop soup or something, then I keep the schmaltz from the chicken separate. With the other stocks, though, the mixed fat gets used for browning meat and such. Just make sure you get all the stock separated from the fat if you are saving the fat, you don't want that to turn it rancid.